As a traveler, every now and then you encounter a place that has special meaning to you. A place that feels like home even though it isn’t. For me, Brazil is that place. My love for Brazil began 8 years ago, when I spent several weeks visiting an American friend who was working in Rio de Janeiro. Though Rio is a beautiful city by any standard, it wasn’t just the city’s natural beauty that captured me – it was the people. After visiting close to 40 countries and hundreds of cities in my life, I’ve concluded that natural beauty is common. What really makes a place special is the people and culture that inhabit it. What makes Brazil special is the warmth, beauty, friendliness, openness, and rhythm of the Brazilians. There are many different ways to travel. One can travel near or far, in luxury or on a budget, by foot or by car, bus, boat, or plane, alone or with a companion, as a spectator or as a participant. Over the past 6 months I’ve tasted them all, but I wanted to reserve for Brazil the most intimate form of travel. The kind where you may stay in one city for several weeks, where you learn the language, make local friends, and immerse yourself in the culture. I’ve been in Brazil now for over 3 months – about a month in Rio, another in Florianópolis, and now a month working my way up the northeast coast. I’ve learned enough Portuguese to carry an extended adult conversation, albeit with the vocabulary of a 5 year old. I’ve come to appreciate the subtleties of the language and culture, from their fantastic way of saying “It’s not my thing” (Não é minha praia or literally “It’s not my beach”) to the differences in culture and accent between people from the states of Santa Catarina, Rio Grande do Sul, São Paulo, Rio de Janeiro, Bahia, Rio Grande do Norte, and Ceará. When traveling, one has to balance to the desire to see lots of places with that of really getting to know that places that you see. I won’t be able to dive as deeply into other countries as I have Brazil, but I think I picked the right country to dive into. My first two months here were spent getting to know just two cities, and the next two months will have been spent knowing the rest of the country. Over the past few weeks I’ve been in “rapid fire mode” changing locations every few days. In the interest of brevity I can only devote a couple of paragraphs to each location, although they all deserve much more. From Florianópolis I left hopped on a bus with two friends to São Paulo, the economic capital of the country. 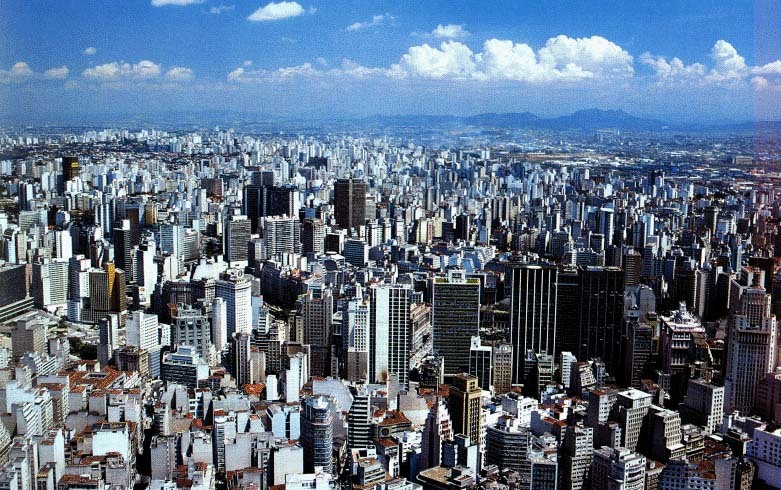 São Paulo is a massive city of almost 30M people, the largest in the entire southern hemisphere. Despite its size the city offers rather little to tourists other than its famed restaurants and nightlife (both of which deserve their fine reputation.) Aesthetically it’s a concrete jungle as far as the eye can see, though surrounded by beautiful green mountains. Talking with locals, São Paulo seems to be a better city to live in than visit – as long as you have money and preferably a helicopter. Its major downsides are high costs and obscene traffic jams. It’s a very modern and well-developed city though, with a cosmopolitan culture and sophistication rivaling New York. From São Paulo I went with my ad hoc travel group of three Brits, two French, and one Brazilian to Parati, a colonial beach town located about halfway between Rio and São Paulo. Parati is known mostly for its pretty beaches and charming colonial old town. 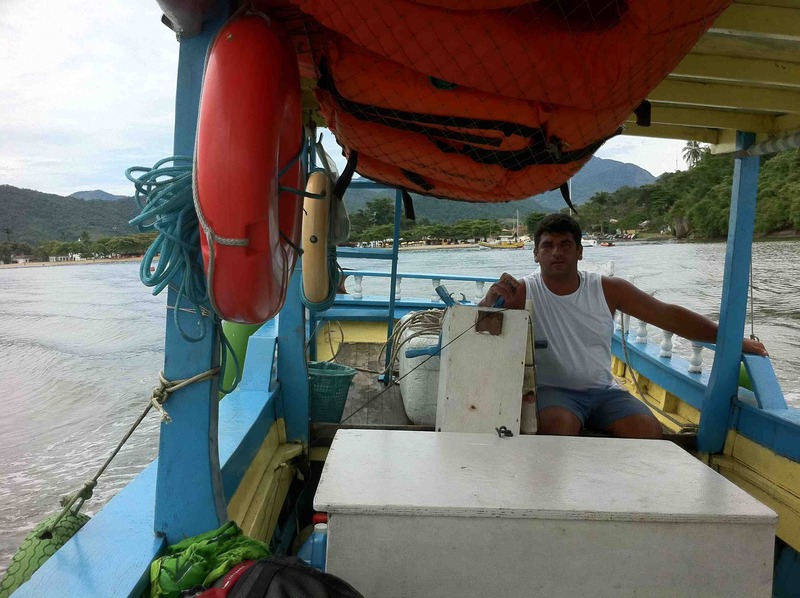 The highlight of our 3 days there was a boat trip to Parati’s tiny neighboring islands. They were beautiful and isolated, and it was fun putting around in a floating shack operated by the day-lighting night watchman of our hotel. Not far from Parati lies Ilha Grande, literally “big island” although for all its supposed size there are no paved roads, no ATM’s, and for the 3 days we were there, no telephone or Internet. The island is dirty and rustic, but that’s part of its charm. 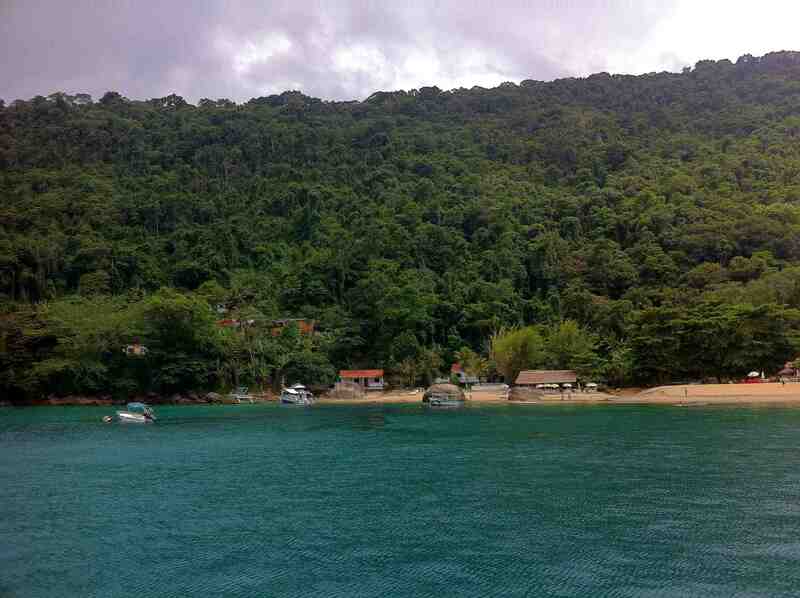 The best thing on Ilha Grande is a beach called Lopes Mendes. To arrive there you can either hike 2 hours through the jungle or take a 20-minute ferry ride – we correctly chose the former. I’ve seen a lot of beaches in my day and Lopes Mendes is one of the finest. It has been rated one of the top 10 in all of Brazil. From the big island we returned to Rio, my second home, for just a few days to regroup (haircut, shopping, laundry, electronic repairs, etc.) From Rio I flew with my friend and travel companion Ben to Salvador, capital of the state of Bahia, which is a world apart from southern Brazil where I’d spent the previous two months. 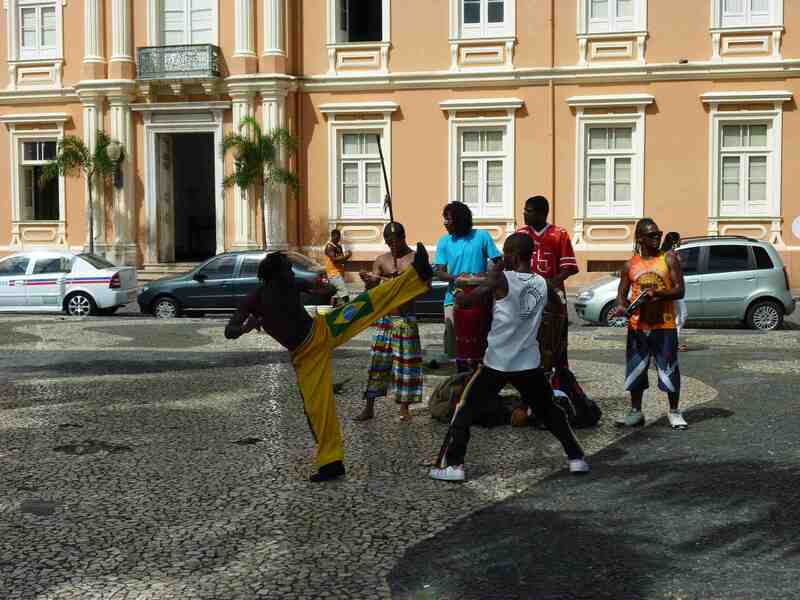 It has a slow pace of life and heavy African influence, marked by spicy and delicious food, the ever-present sound of drum beats, capoeira in the streets, and the dark complexion of its residents. 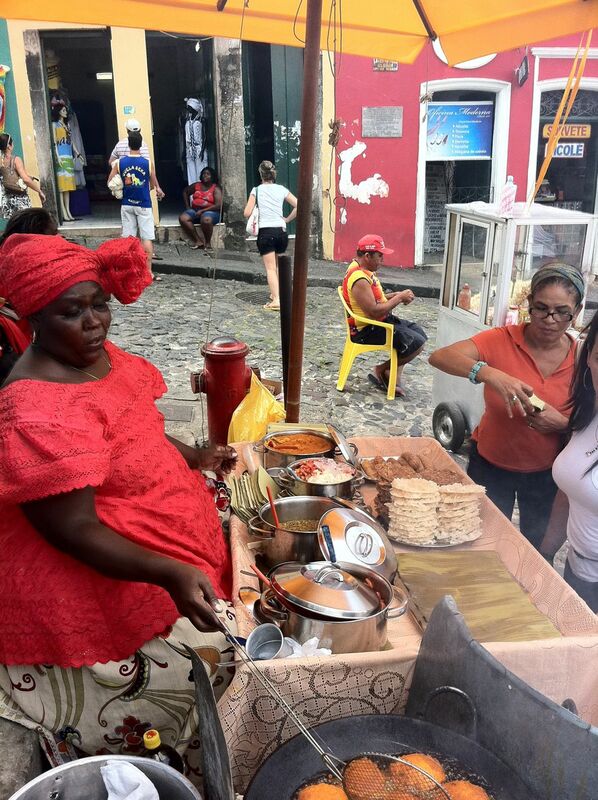 The best things to do in Salvador are roam around the colonial center and taste the local specialties like moqueca de camarão (a stew made with shrimp, onion, garlic, peppers, coconut milk, dende oil and lots of spices) and acarajé (a sandwich-like food make with dende-fried white beans, dried shrimp paste, onions, and a fish-flavored sauce.) We wanted to take capoeira lessons but unfortunately time didn’t allow it. 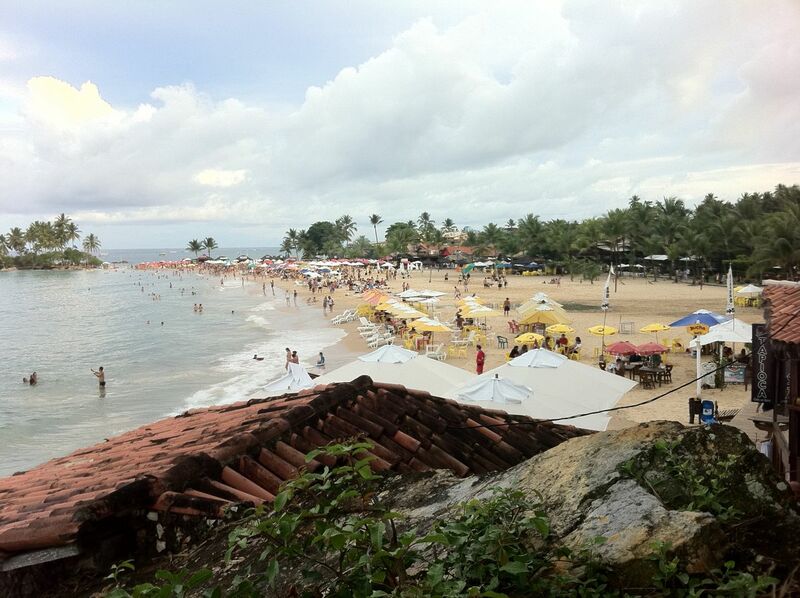 About 2 hours from Salvador by boat lays a touristy island called Morro de Sao Paulo. 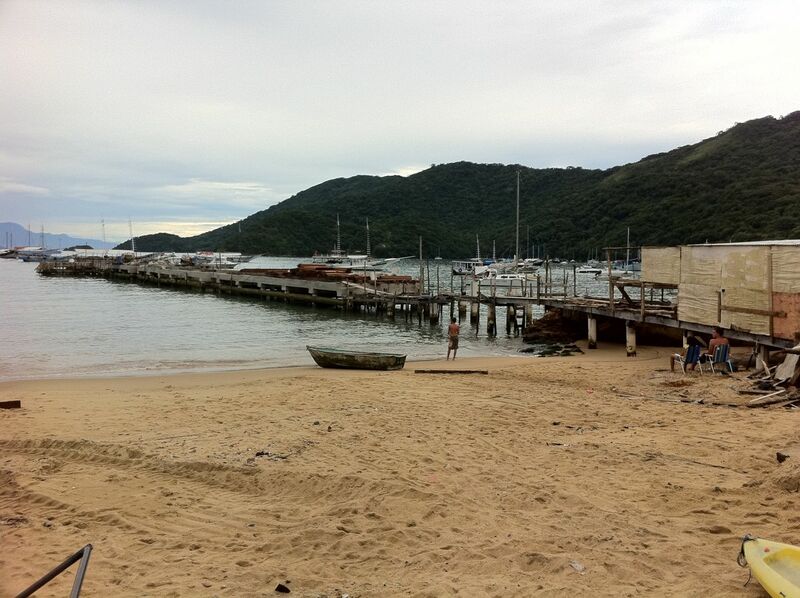 Morro is somewhat like Ilha Grande in its lack of paved roads, but I found it to be cleaner and more charming. 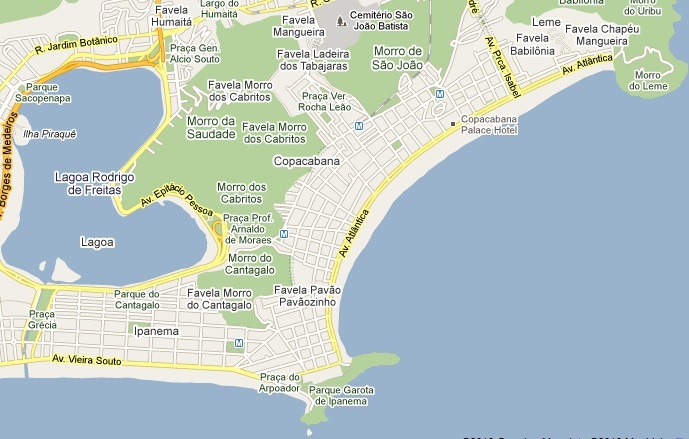 The local culture in Morro is similar to Salvador, though even slower and more laid-back if you can imagine. 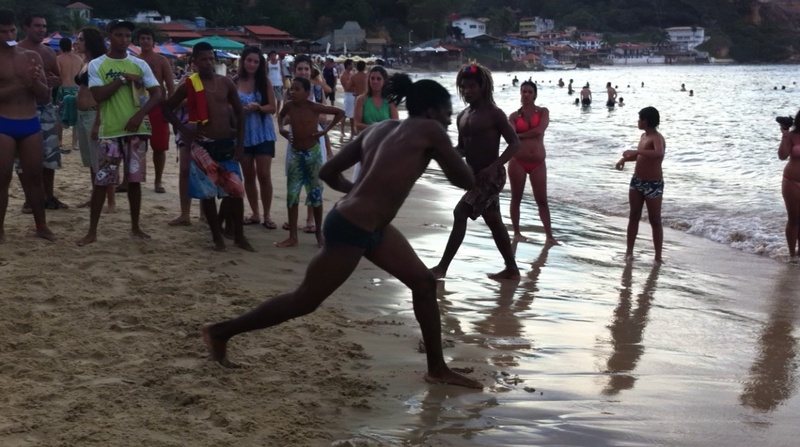 Instead of performing capoeira in the streets, they do it on the beach. In Morro we were surprised to hear more Spanish spoken than Portuguese, as we inadvertently arrived on the island during a holiday weekend for Argentineans. This actually presented a bit of culture shock. I didn’t realize how accustomed I had become to Brazilians until I was surrounded by 95% Argentineans. After a few days in Morro we caught a flight from Salvador to Natal, farther up the coast in the state of Rio Grande do Norte. 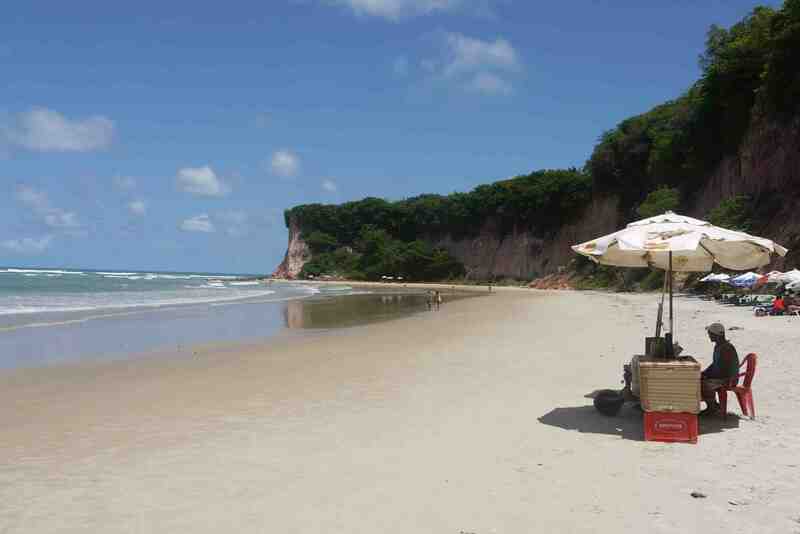 Natal is the capital of its state, but still a beach town through and through. Tourists flock to its high-rise hotels and condominiums year-round, especially those dotting the white sands and turquoise water of Ponta Negra beach. It’s also a popular jumping off point for the smaller beach towns to its north and south. 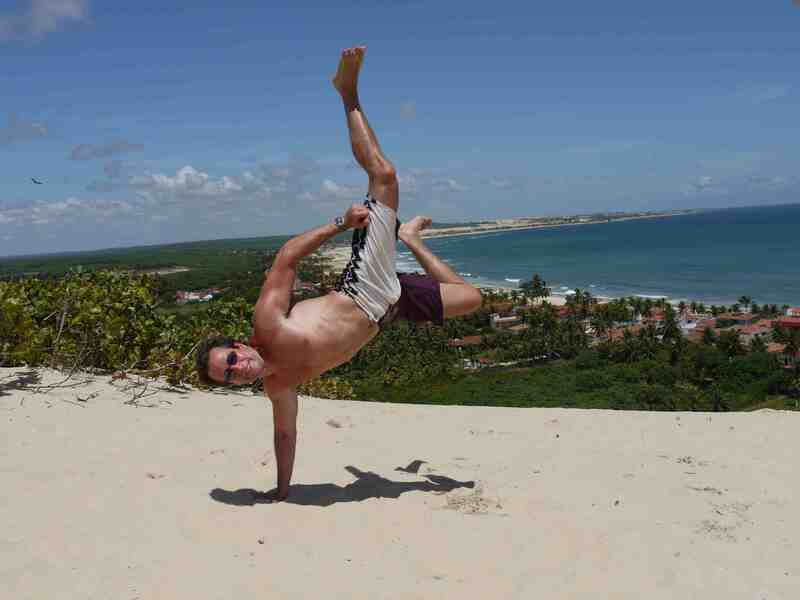 Natal is famous for its massive sand dunes. 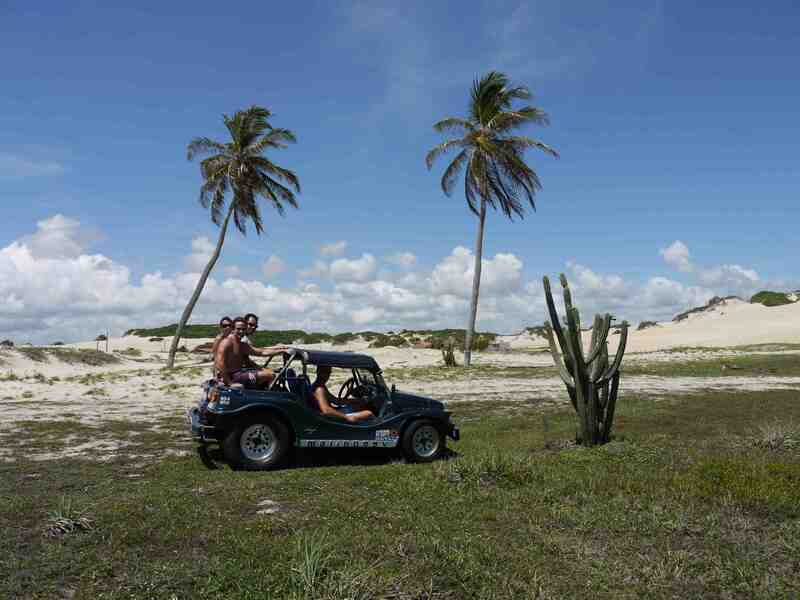 The highlight of our three days there was an all-day dune buggy ride to explore them along, with the beaches to Natal’s north. Our guidebook said that your buggy driver will offer a ride com emocão (with excitement) or sem emocão (without excitement.) Our driver never asked but clearly chose the former. Fortunately he was a pro with over 30 years experience driving the dunes. The scenery was as breathtaking as the ride and our cameras were snapping non-stop. The best way to know where to travel next is to listen to the locals, and just about every Brazilian that we met said that we have to visit Praia da Pipa, a small beach town about an hour from Natal. They were right. Pipa has the best of all worlds – postcard-perfect beaches, good nightlife, laid-back vibe, good restaurants, and just the right level of development (paved roads but no high-rise buildings.) In terms of total package, it’s probably my favorite spot in Brazil thus far. 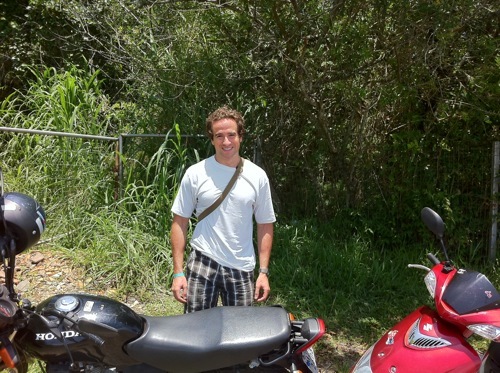 We stayed in Pipa for a full week, which is a lot for this mode of travel. 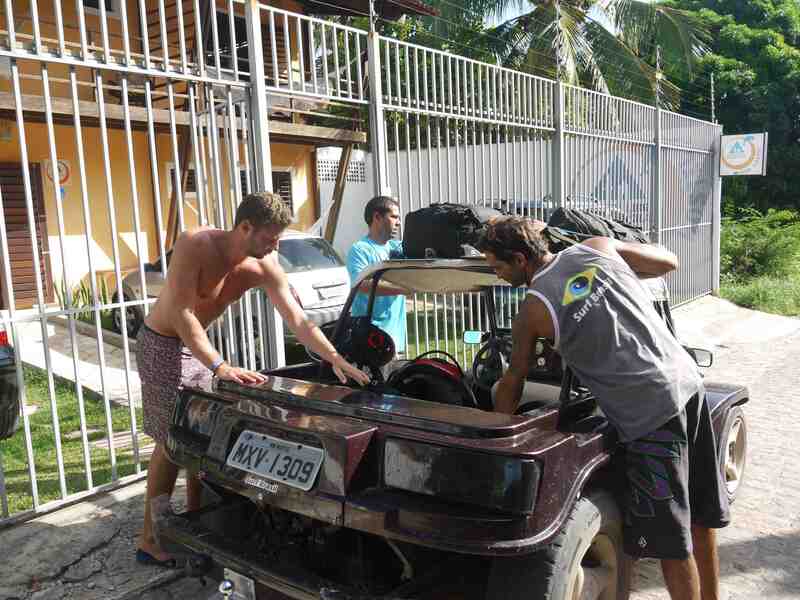 Both the best and worst day of it was when we took a 20-minute dune buggy ride to Barra da Cunhau for a kitesurfing lesson. Barra was a perfect spot for kitesurfing, a shallow saltwater lagoon with good wind and flat water. However, about halfway into my lesson I injured my right foot badly, ending the lesson early and giving me a limp for next several days. After a brief stopover in Natal to extend my visa, we flew to a ridiculously gorgeous volcanic island called Fernando de Naronha, about 350 kilometers off the northeast coast of Brazil. 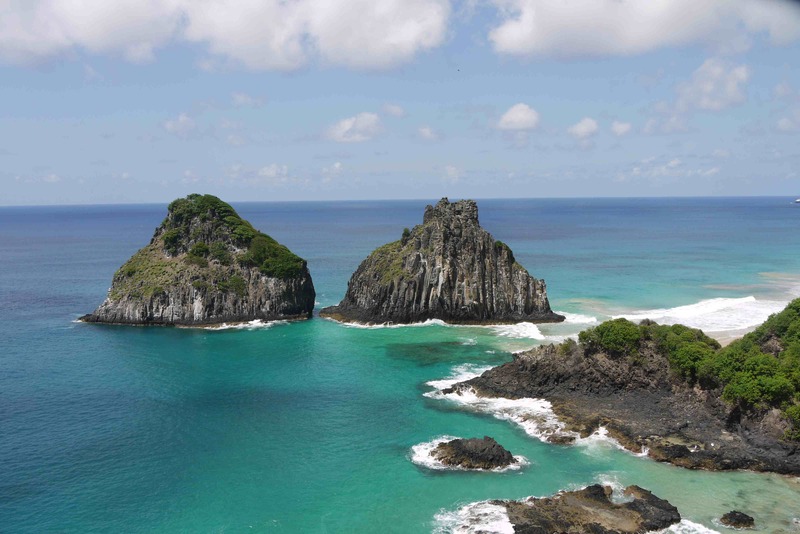 Noronha is so beautiful that it’s difficult to put into words. It was easily the most visually stunning island that I’ve seen in my life, and I’ve seen a lot. The island is touted as an eco-destination and its natureza is protected carefully by the Brazilian government. No more than 460 visitors are allowed there at a time, and each pays a substantial daily “nature preservation” tax for the privilege. It’s also expensive to fly there and once you arrive everything costs 50-100% more than on the mainland, but if you can afford a few days in Naronha it’s not to be missed. The highlights for us were 1) a scuba dive around the tiny uninhabited islands surrounding Naronha, and 2) a self-guided bicycle tour to some of its many beaches. Choosing your favorite beach in Naronha is like choosing your favorite supermodel, but I give a special nod to Baia do Sancho and Baia dos Porcos. One of the oddest effects of extended travel is how it alters your perspective of time. In my life back home in the States, a day was a long period of time. A lot happened in a day… 8 hours of work, 3 scheduled meals, 1 workout, and perhaps a couple of hours of socializing with friends. At the end of the day, I was exhausted. Now a day is nothing. A day could be spent just moving from one location to another, just talking with friends on the beach, or just riding a motorcycle around an island. A lot can be accomplished in a week, but not in a day. My new perspective of time was epitomized by the 5 weeks I spent living in the Brazilian paradise known as Florianópolis, or “Floripa” as the locals call it. Those 5 weeks flew by in a flash, and all I have to show for it is a tan, a couple hundred photos, great memories, and dozens of new friends from Brazil and abroad. It may not sound like much to you, but to me it’s a bounty. 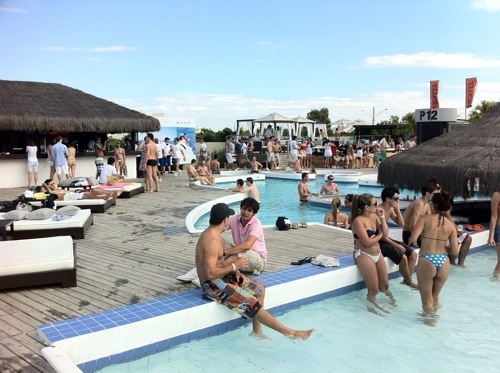 Floripa is general considered the most livable place in all of Brazil. It has abundant natural beauty, 42 beaches (including some of the best surfing beaches in the country), low crime, beautiful people, delicious seafood, good weather, lively nightlife, and a perfect size of around 400,000 inhabitants. You know a place is special when even cariocas, people from Rio, get jealous of you for living there. Five weeks is certainly a long time to devote to one place when taking a traveling sabbatical, but if any place in the world deserves it, it’s Floripa. I was transported around this little island paradise by a 125cc black Honda motorcycle that got such good mileage that I only filled the tank every couple of weeks. We became very good friends. It didn’t take me long to figure out the best dish to order there… camarão ao óleo e alho (shrimp cooked in olive oil and garlic.) 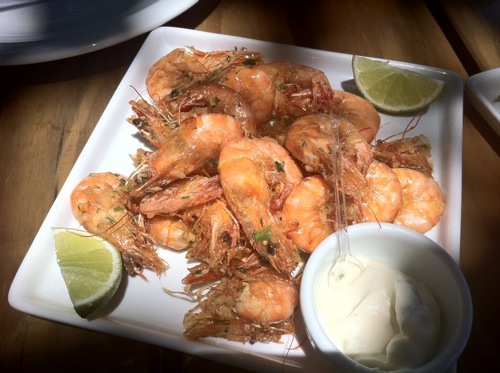 Floripa is known for its fresh shrimp and oysters, and even dive bars there serve it up to perfection. 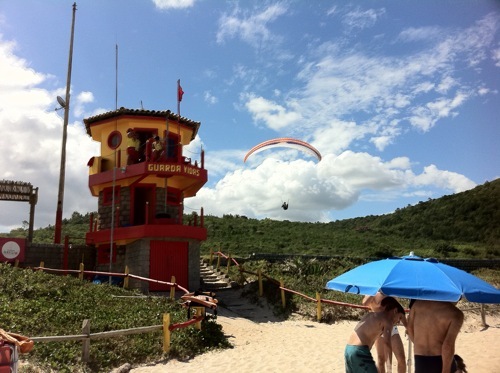 Floripa is known as a haven for outdoor adventure sport enthusiasts. They have just about every warm-weather adventure sport imaginable: hang gliding, paragliding, sand boarding, surfing, kite surfing, windsurfing, and more. I had a few kite surfing lessons there but fortunately there are no photos to document my epic wipe outs. And then there are the parties… Floripa has a very distinct high season during the Brazilian summer, starting in mid-December and ending after Carnival in March, during which time the population swells 3x to around 1.2M people. Brazilians flood in from São Paulo, Rio de Janeiro, Minas Gerais, Rio Grande do Sul, etc. and are joined by gringos from Australia, the US, Great Britain, the Netherlands, Germany, and elsewhere. The high-end clubs make most of their profits for the year during this period and there is definitely a South Beach-like vibe. During the week of New Years, the top clubs charge up to R$600 (around $350 USD) just to get through the door. You can imagine the kind of cars that are parked outside. After spending so long in Floripa, I got a flavor for not only what it’s like to visit, but to live there as well. I arrived in late November before the high season began and spoke with lots of locals about their lives there, so I also have a good idea what it’s like during the rest of the year. Other than the difficulty in finding work there and a short but somewhat chilly winter, it really does seem like paradise. Floripa is one of those special places that will always hold a piece of my heart. How do I begin to talk about Machu Picchu? First of all, this blog post is going to be a little different from the others because it will also serve as travel advice (especially to my friends who are heading to Machu Picchu in the next month or so). I started on my adventure to Machu Picchu by taking a 10 hour overnight bus from Arequipa to Cusco. I arrived in Cusco at 7am and immediately went to my hostel to go to sleep. It is impossible to sleep on the bus when the roads are never straight and your driver is set on passing every other bus and truck on the road. In Cusco, I stayed at the Pariwana Hostel which was perfect for me. It’s in a great location, very clean, hot showers, free wi-fi, free breakfast, and full bar/restaurant to order from throughout the day. I spent the day catching up on sleep and emails and wondering around Cusco a little bit. I made a friend on the bus on the way to Cusco and it just so happened he was staying in my same hostel so the two of us went out for dinner that evening at Los Perros. 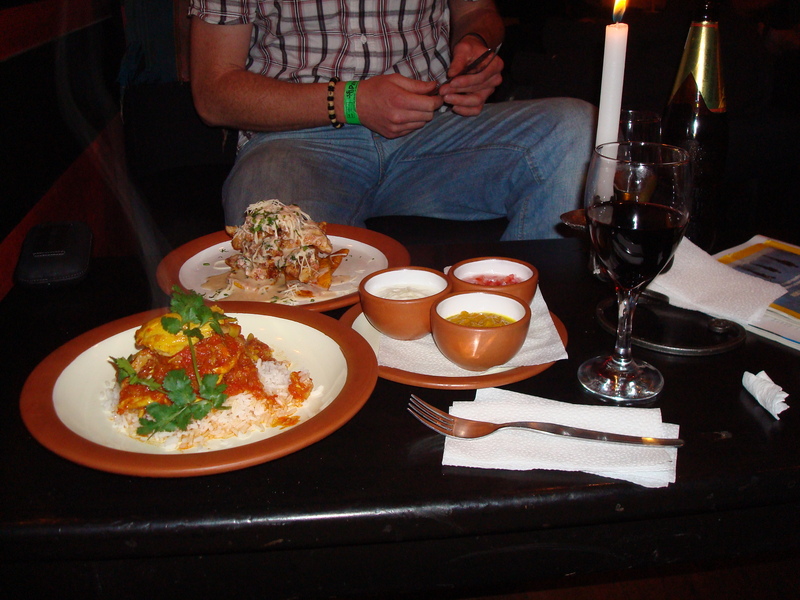 I had a really good chicken curry dish and a glass of well deserved wine. 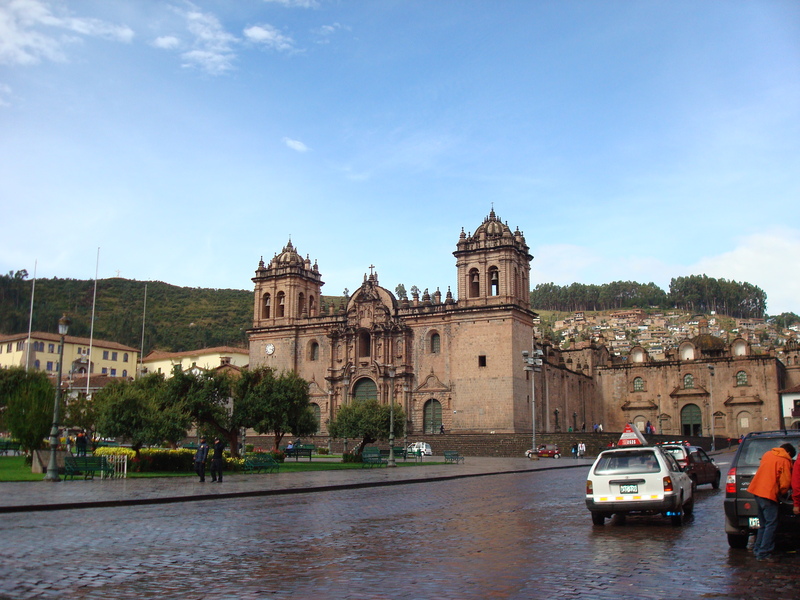 Cusco is a great city and has so many different restaurants available. I woke up early the next morning because I had to take a cab to the Poroy (Cusco) train station which is 20 minutes away. I decided to take the train straight from Poroy to Aguascalientes (known as Machu Picchu town), but most backpackers take a combi or bus to Ollantaytambo and catch the train from there to Aguascalientes. It saves them some money and actually a little bit of time as well, but I was just lazy and had earlier decided that I just wanted to sit and enjoy the train ride. The train ride from Cusco to Aguascalientes takes 4 hours and depending on the train you’re on, they serve you a snack or a meal. I arrived in Aguascalientes just before noon and a guy from my hostel was waiting for me and some other guests at the station. Aguascalientes is extremely small and you can book a place once you get there as long as you’re not visiting during the high tourist season (may- august). There are no cars in Aguas and you can walk the entire town in about 10 minutes or less. I stayed at the Pirwa hostel which was fine for me…nothing special, but nothing to complain about either (oh…except for that enormous spider that I killed in my room). I had the entire afternoon to kill because I was not going up to Machu Picchu until the following morning. I went and bought my ticket to Machu Picchu (126 soles or about $45 for a foreigner non-student) and I bought my roundtrip bus ticket ($14) to go up and down to Machu Picchu. I highly recommend buying your tickets the day before so you do not have to bother with it at 5am the day you want to visit. Of course there are tourists that visit throughout the day and you can go up at anytime, but I wanted to be there early for 3 reasons. One, I wanted to be one of the first visitors in the park so I could get pictures without a ton of people in them. Two, it’s cooler in the morning. And three, if you want to climb up Wayna Picchu, you have to be one of the first 400 people there to get your stamp. Wayna Picchu is a small mountain at the far end of the park and they only allow 200 people to climb it at 7am and 200 people to climb it at 10am. You can choose which time you want when they stamp your ticket. 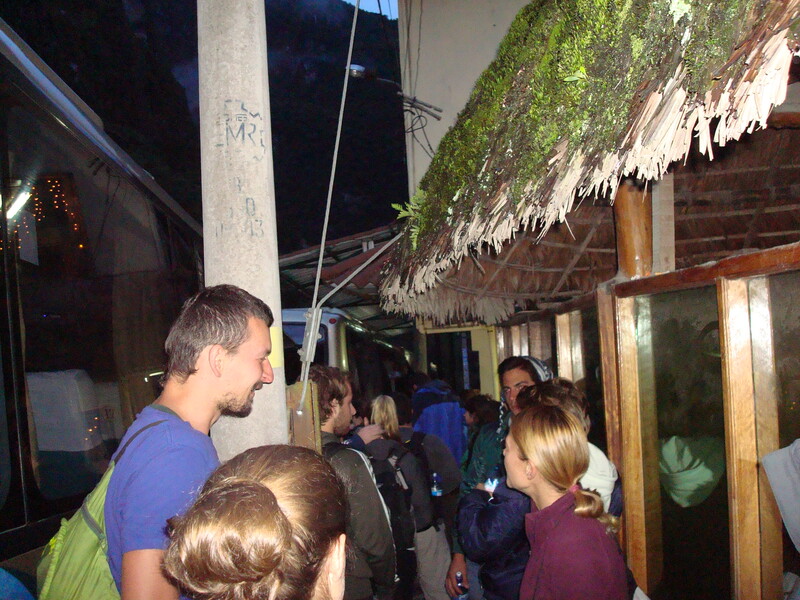 The first bus leaves to go up to Machu Picchu at 5:30am so the line starts forming around 4:30am. The bus ride is about 20-25 minutes each way. ***You must buy your entrance ticket to Machu Picchu down in Aguascalientes. They do not sell tickets at the park entrance. 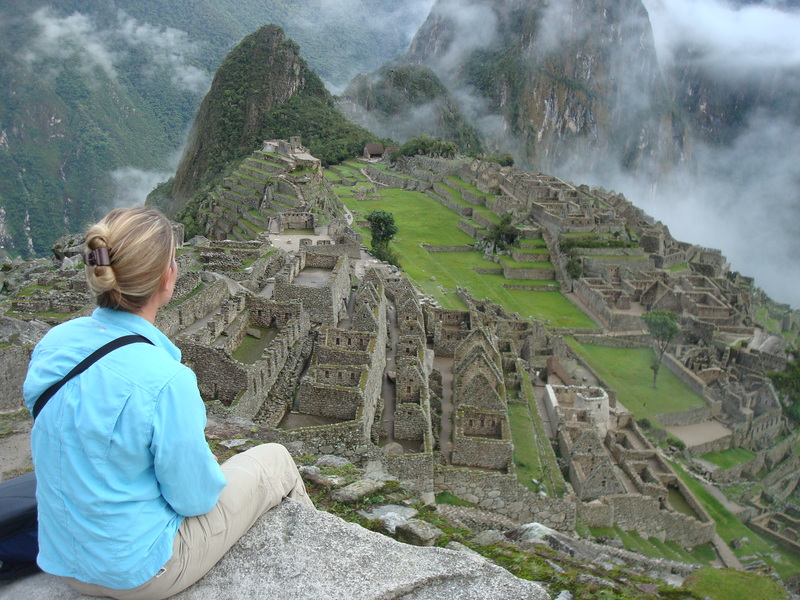 There are so many rules when visiting Machu Picchu…no walking sticks, no food, no water, etc. Not one person had their bag opened and searched. I brought in a 1.5 Liter bottle of water and plenty of snacks. They just don’t want anyone leaving trash so be respectful of that and bring out whatever you brought in. Also, there is only a bathroom at the park entrance for 1 soles ($0.30) and no bathrooms once you are inside. As far as walking sticks go, I saw people with them, but only elderly visitors (maybe they make an exception for them). Another important reminder! Bug spray and sunscreen. I wore pants and a long sleeve shirt and sprayed deet on myself and did not get one bug bite (if you know me, you know that I am prone to getting eaten alive and have really bad reactions). It was cool the morning I visited, so I was fine being covered up. I also left a lot of my stuff down at my hostel in a locker so I wouldn’t have to carry so much around. I think every hostel/hotel in Aguas offers this complimentary. Also, bring your passport!!! You can get your passport stamped that you visited Machu Picchu between 9am – 5pm at the office as you walk into the park. They have maps available for free at the entrance office or where you buy your ticket in Aguas. I found the map and route very easy to follow and did not want to pay for a guide. If you enjoy having a guide with you, you can hire one at the gate to the park or down in Aguas. I have heard they charge around $100, but I can’t be quoted on that. Machu Picchu itself is so incredible to see in person. I tried to understand how the Incan people built this incredible city so far into the jungle. The views are breathtaking no matter what the weather may be. I immediately went to left after entering the park and walked for about 10 minutes up a bunch of stairs to get a view of the entire city from above. Some people decide just to walk into the city, but I don’t think you can appreciate it unless you see the entire thing from above. I highly recommend visiting while you are physically capable to doing everything in the park. As I walked through the homes, temples, and central areas, I tried to imagine the city inhabited with families and children and what it would be like to live that high up into the mountains and jungle. After I finished visiting the site, I headed back down to Aguascalientes to soak in the thermal baths. They are only 10 soles ($3.50) to visit, but I did get some bug bites here. I guess my deet wore off. 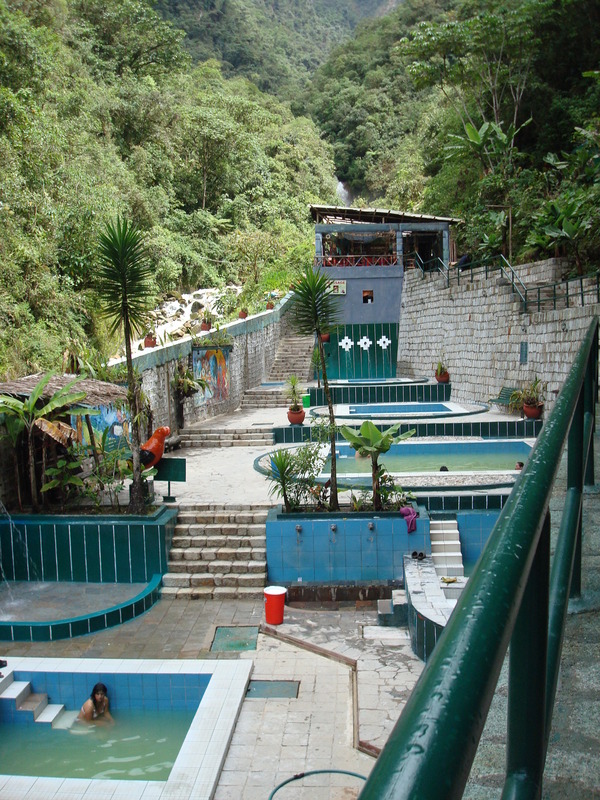 The thermal baths feel great after walking up stairs and around the city of Machu Picchu for hours. 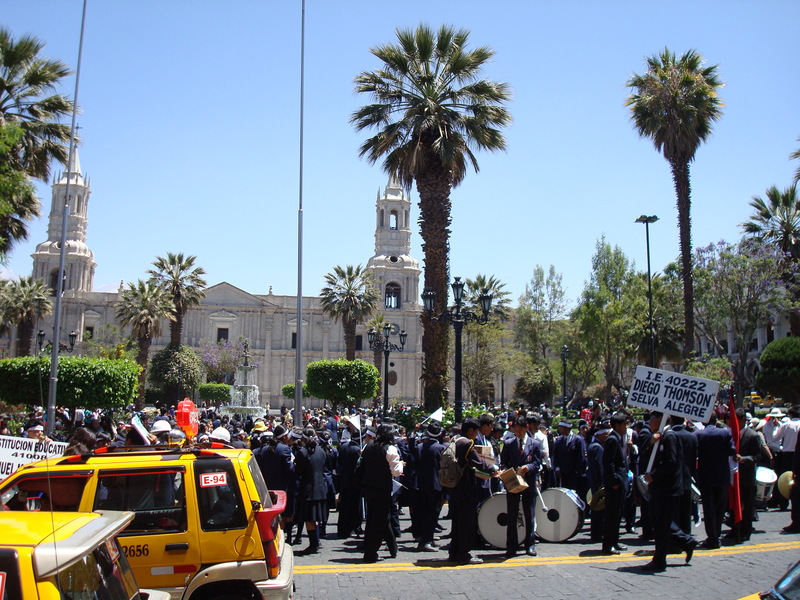 One note about the town of Aguascalientes…I have not known anyone to visit there and not get some sort of food poisoning. I even met a guy that ended up in the hospital for 3 days with salmonella poisoning from a chicha drink (fermented corn drink popular in Peru). Most people just have the typical food poisoning consisting of running to the bathroom and throwing up. I decided that if I was going to eat in Aguas, I was going to eat right. I found the most fantastic restaurant called The Tree House Restaurant which is part of Rupa Wasi resort. This resort is also a nice place to stay, but a little pricey ($80) and they teach cooking classes for $35 every afternoon at 5pm in their kitchen. I spent around $20 for my meal, but it was fantastic and I did not get sick. I also ate this meal late in the afternoon so it was my late lunch/early dinner which made it pretty economical. 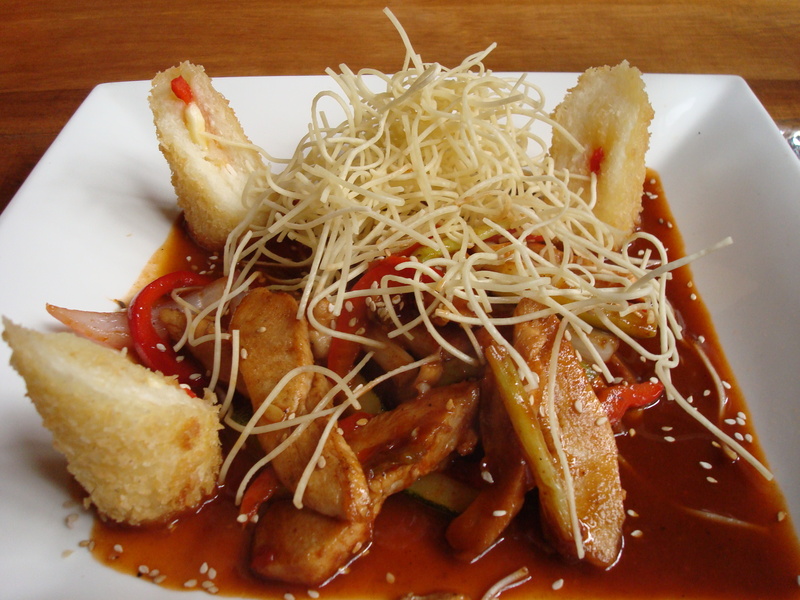 The next day, I had a vegetarian lunch before I left Aguas at a coffee shop in the center of town. 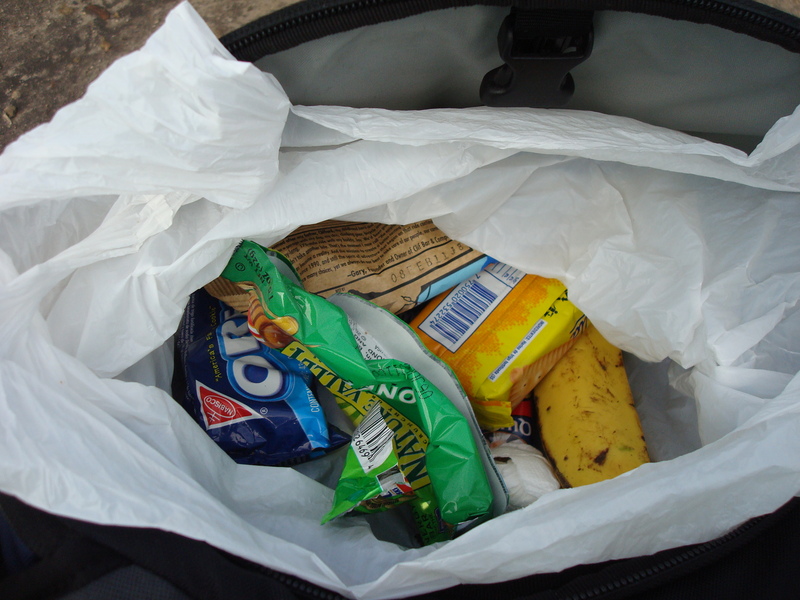 I tend to bring a lot of snacks with me everywhere just in case I do not find somewhere that I want to eat. My meal at The Tree House Restaurant...I had already started to eat it! I hope this post helps my friends and anyone who reads this with their visit to Machu Picchu. It does require a little planning, but it is not a difficult place to visit. Enjoy the pictures and feel free to post any comments or questions. Now, I’m off to Panama!!!! I have just arrived in Cusco, Peru after living and volunteering in Arequipa, Peru for one month. I was living with an incredible host family and volunteering in a rural school with 4 and 5 year olds. My family was extremely welcoming and fed me yummy Peruvian food every night. I had two host brothers that were 21 and 10 years old which I got to know fairly well over the month. We played games, talked about going out with friends, watched TV together, and practiced our respective languages with each other. I volunteered with GVI (Global Vision International) for one month which consisted of one week of intensive Spanish language courses and three weeks of volunteering in the 4 and 5 year old class in one of the schools. My kids were absolutely adorable and I really wanted to bring one of them home with me because he was so cute. Some of these kids come to school to escape their lives at home. We give them positive attention, hugs, teach them classroom skills, and even play skills (these don’t come natural to them), and of course provide a warm meal for lunch. These children are so resilient. Most of them live in pretty harsh conditions which are evident when you see wind/cold burns on their faces, dirty clothes, protruding stomachs, and the fact that some of them do not know how to use a toilet. Friday was my last day at the school and each child made me a card, gave me a hug, and thanked me for helping at their school. I hope these kids got as much out of my time with them as I got myself. I have learned so much this past month about these kids and this community and also about myself. These kids do not know that there is more out there in the world. They do not know that they can strive to learn more, finish their educations, and find a job one day because no one around them has shown them. Someone told me, “You won the lottery when you were born where you were born”. I am so grateful for the supportive family and friends that I have, the opportunities that have been presented to me, and the positive nature in which I was raised. My time in Arequipa has been unforgettable and I cannot wait to return one day and visit with my host family again. I visited Machu Picchu yesterday and a blog post will be coming soon! 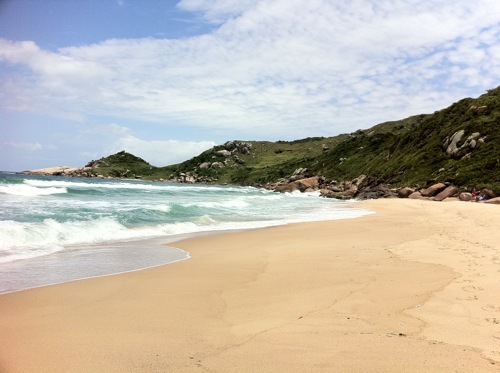 Greetings from Florianopolis, a charming, laid back island in the south of Brazil. I arrived here just yesterday after spending nearly 4 weeks in Rio de Janeiro, or “a cidade maravilhosa” (“the marvelous city”) as its known here in Brazil. After living there for nearly a month, I understand how Rio earned its title. I originally visited Rio in 2002 and have dreamed of going back ever since. There was something about the city that captivated my imagination. I got an itch that I knew only living there for a month or so would scratch. On this trip, my life in Rio wasn’t that of a tourist but a local. I intentionally didn’t see a single tourist attraction while I was there, unless you count Ipanema beach. This time I didn’t want to just see the city, I wanted to feel it. I typical day for me in Rio consisted of sleeping late, enjoying a midday acai, going for a run by the beach, eating a lunch of arroz, fejao, and picanha (rice, black beans, and steak), taking a nap, and then meeting some friends out for dinner and drinks. I made an effort to meet as many Brazilians as possible, although I often found myself spending more time with the foreigners that I met at the shared Ipanema apartment that I rented. When the wind was cooperative I’d take a kitesurfing lesson in Barra, a suburban beach neighborhood. For those who haven’t visited Rio I’ll try to put it into words, but to paraphrase Elvis Costello, writing about a city’s vibe is like dancing about architecture. 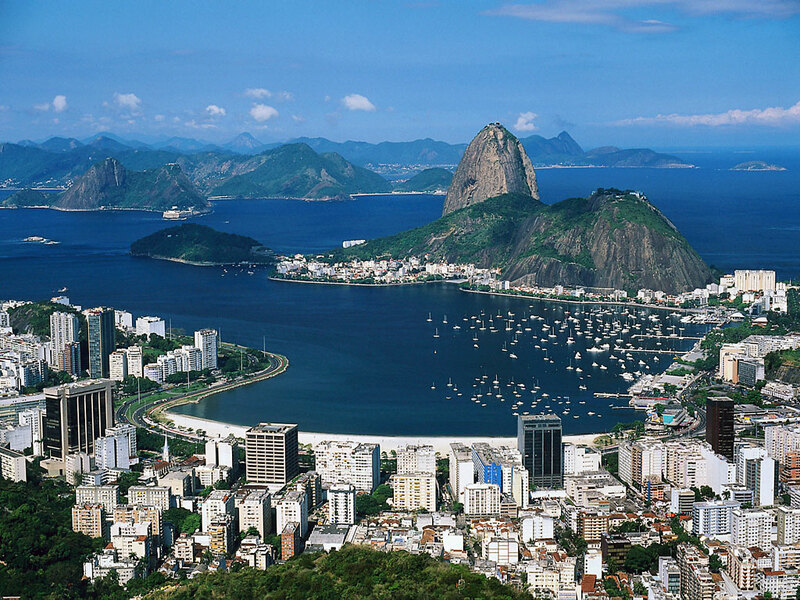 Aesthetically, Rio is as beautiful as the people who inhabit it. I would argue there’s no major city in the world situated in as beautiful a location. The city is wrapped around several beaches, the most famous of which is Copacabana, a 4km crescent-shaped stretch of sand that symbolizes the city. Behind the city lies several jagged, uninhabitable green mountains. Because it’s so beautiful and has such scarce inhabitable land, real estate in Rio is the most expensive in South America. But that’s just aesthetics. What really drew me back to Rio is the city’s vibe. Cariocas, or Rio residents, really know how to live. They look for any excuse to eat, drink, socialize, and have a good time. They don’t just go to the beach, they worship it. I’ve visited over 40 countries and hundred cities, and I’d have to say that cariocas are the warmest and most affectionate people I’ve ever encountered. You see it a thousand different ways, from how a total stranger will gently squeeze your hand to get your attention, to how closely cariocas stand when they talk to each other, to how every email is signed either beijos (kisses) or abraços (hugs). Even the guy I bought an electronic accessory from on MercadoLivre, their eBay, sent me a hug. They have a free outdoor gym in Ipanema called Muscle Beach, modeled after the one in Venice Beach, California. Although the one in California is dominated by body builders, the one in Rio is just full of regular tan Brazilians wearing just enough active wear to cover what’s legally required. 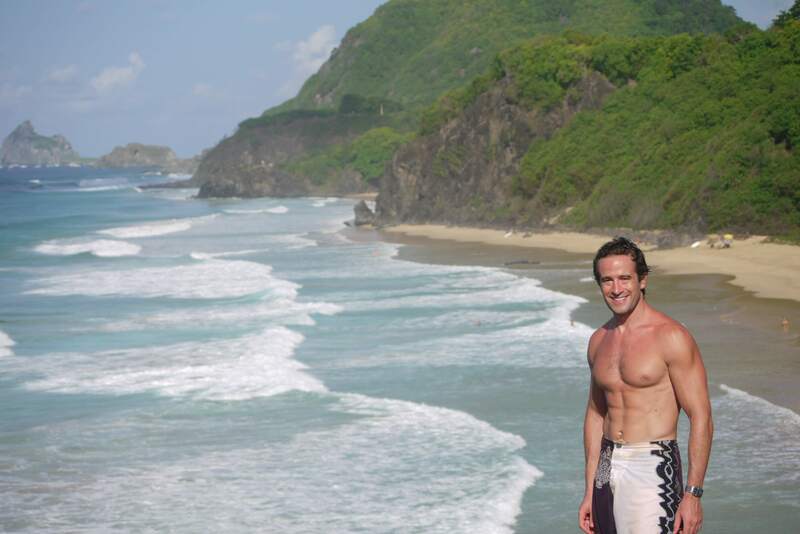 There are also several “jungle gyms for adults” up and down the beach where one can do pull-ups, push-ups, and dips. As you can imagine, the carioca body is a fit one. Rio is like Los Angeles, California, in the sense that it’s all about the beach, sunshine, and living for the moment. The carioca would much rather sit at a beachside bar drinking a suco (fresh fruit juice) or caipirinha (cocktail made with cachaça, sugar and lime) than see an opera. It’s fair to say that they aren’t the most cultured people in the world, but cariocas are amongst the happiest. Despite its many charms, Rio is far from a paradise. The city is burdened with some serious social problems. The gap between rich and poor in Rio is staggering, and the latter out-number the former by a very wide margin. Many of Rio’s lower class life in the favelas, or shanty towns, that dot the green hills overlooking Rio’s famous beaches. Ironically, the favela dwellers enjoy the best views in the city. In poor neighborhoods in the US, law enforcement may be stretched thin. In the favelas, law enforcement literally doesn’t even exist. The government offers no public services in the favelas, although this is just now starting to change. There is no police presence save for a few corrupt cops in the pockets of the drug lords. There are no hospitals, no mail service, no fire stations… nothing. These entire massive neighborhoods are essentially just written-off by the rest of Rio’s society, which is astonishing considering that only a few meters separate Rio’s poorest favelas from its richest neighborhoods. The streets in the favelas don’t even show up on maps. I visited a favela one afternoon with a Brazilian friend and it was an eye-opening experience. What struck me wasn’t the poverty as much as the anarchy. A mess of poorly cables strung cables bring illegal electricity and cable TV to homes, which range from a dirt-floor-and-tin-roof-huts to comfortable two-bedroom concrete apartments. The only restaurants are small open areas at the bottom of someone’s home with a few plastic tables and chairs. Name brand stores don’t exist. Sixteen-year-old boys working for the drug lords ride around on old Honda motorcycles with assault rifles strapped across their backs. Most adult men carry a handgun. Unfortunately I don’t have any photos from the favela because I was strongly advised to leave my camera, and wallet, at home. Without any real government, the power vacuum in the favelas is filled by the drug lords, who act as tax collector, police, judge, jury, executioner, and occasional benefactor. There is a continual tension between the drug lords and the police, or at least those cops who aren’t paid off by them. The tensions reached a high point toward my last week in Rio, evidenced by a wave of violence that was pretty bad even by Rio’s standards. The media called it guerra civil, or civil war, which I think was a bit of an exaggeration. That said, dozens of cars and buses were burnt in the street, several dozen innocents were killed, and there was a palpable sense of fear in the city. If you talk with a carioca they will readily admit that their city has many problems, but if you ask them if they’d live anywhere else they look at you like you’re crazy. By the way, ask a Brazilian if they know how to samba and they’ll give you a similar look… as if you’d asked them if they knew how to walk. Rio’s charms far outweigh its problems though, and no matter where the rest of my travels take me, I know that I’ll always feel a degree of saudade, or deep longing, for a cidade maravilhosa. 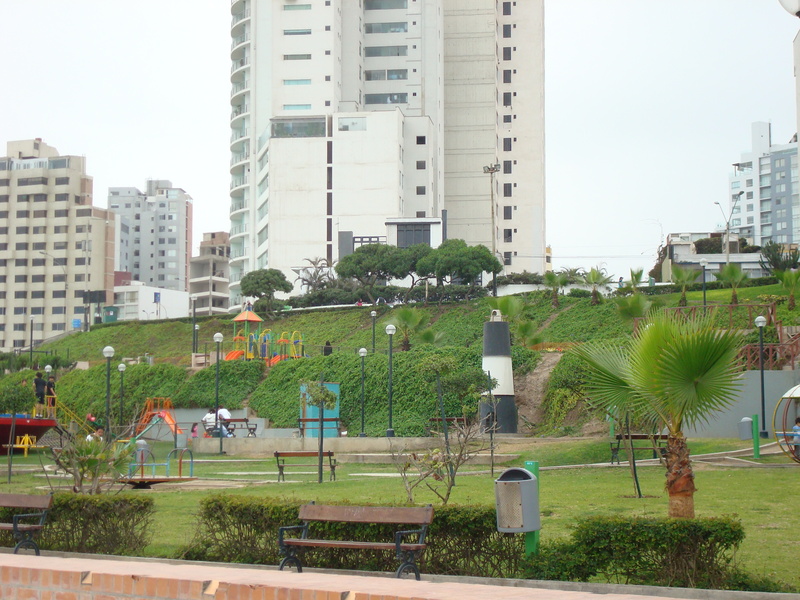 I landed in Lima, Peru last Saturday and have been pleasantly surprised everywhere I go. I stayed in the neighborhood of Miraflores in Lima and enjoyed walking around town on my own, watching surfers and paragliders along the beach, participating in the nightlife, and trying my first Pisco Sour (grape brandy known as Pisco, lime juice, sugar syrup, and egg whites). I was told by everyone to just past through Lima, but I am so glad I didn’t listen because it turned out to be a wonderful 3 days. I met some nice travelers at my hostel and 4 of us decided to travel together to the next city. From Lima, we took a 5 hour bus ride south to the city of Ica. 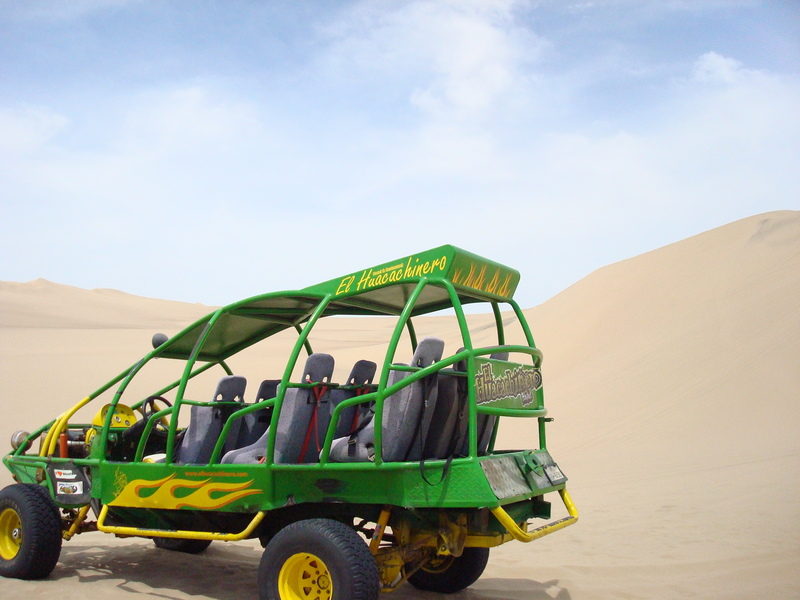 There is a small town called Huacachina which is a 5 minute taxi ride from Ica which used to be a getaway for the Peruvian elite. Now this town caters to backpackers. 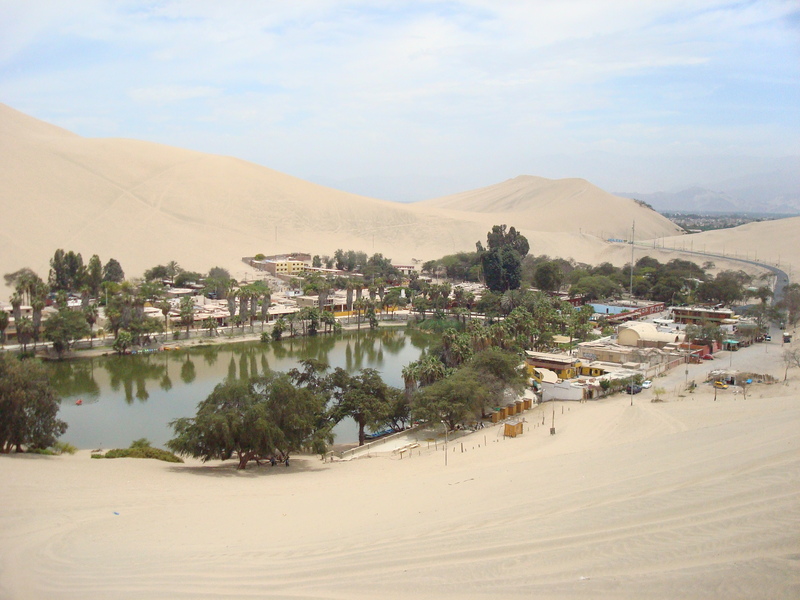 This small town is an oasis in the middle of the desert and surrounds a lagoon. We stayed for 2 nights to enjoy some much needed relaxation at the pool, sand-boarding down the incredible desert dunes, and winery and Pisco winery tours. Everything is very reasonable if you are traveling on the US dollar, New Zealand dollar, and Euro. Average cost for a nice meal is 15 Peruvian Soles which is about U.S. $5.35 although I was finding pretty good meals for only 10 Soles. All of the tours cost around U.S. $10 and an average accommodation is U.S. $10 a night. My friends and I went in different directions from Ica. I took an overnight bus to Arequipa where I will be a volunteer teaching in a kindergarten class for the next 4 weeks. Arequipa is Peru’s 2nd largest city which lies at the base of El Misti and experiences earthquakes often (I was told they felt one last weekend). There is the saying here, “When the moon separated from the earth, it forgot to take Arequipa” referencing the city’s colonial buildings built from an off-white volcanic rock called sillar that shines in the sun. The weather here is consistently sunny and warm during the day and cool at night. I will be taking Spanish language one-on-one tutoring beginning Monday for an entire week so I will be ready to help at the school the following week. 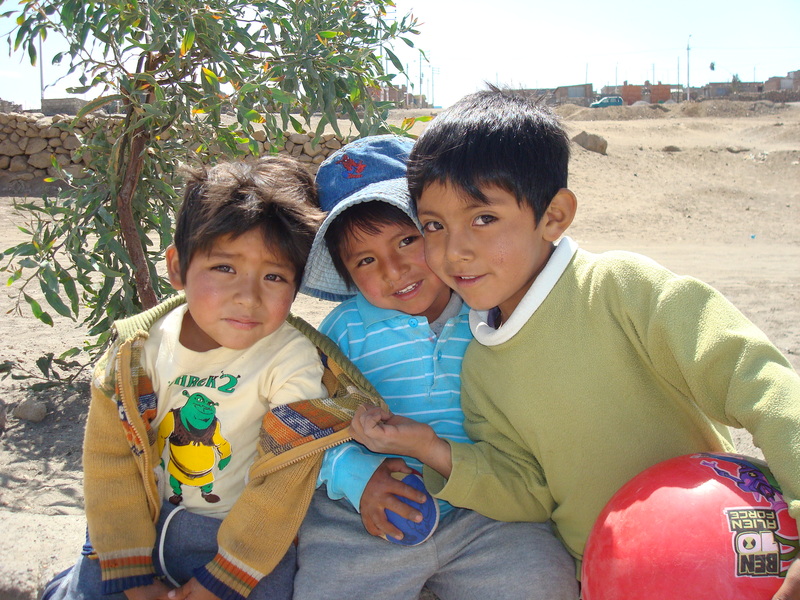 I will also be living with a host family here in Arequipa which I will get to meet tomorrow afternoon. So far I have enjoyed everywhere I have been in Peru and would recommend it to any travelers (especially when on a tight budget). I plan to do a 3 day trek in the Colca Canyon (more than twice as deep as the Grand Canyon) and visit Chile and Lake Titicaca on the weekends. 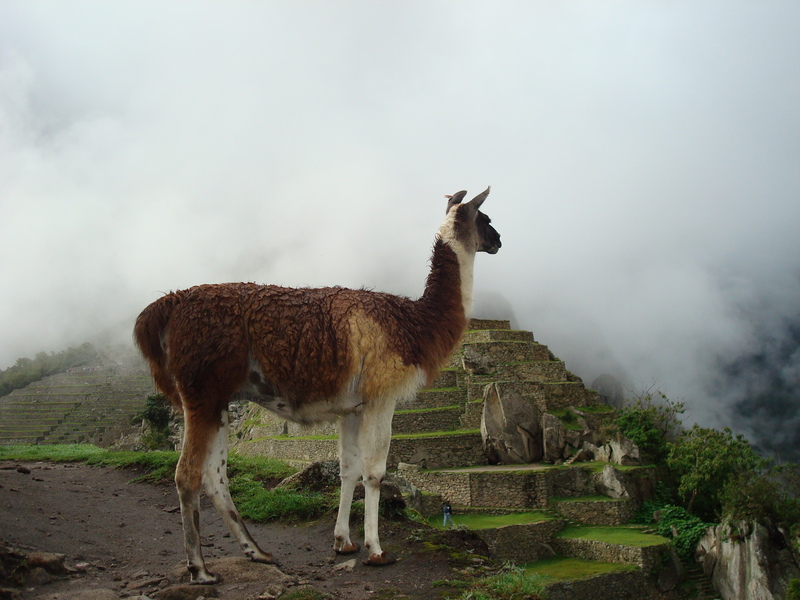 I will make my way to Machu Picchu via Cuzco once I am done with my volunteer program in Arequipa. We recently completed a 16-day transatlantic cruise that began in Rome, Italy, and terminated in Ft. Lauderdale, Florida, USA. We never really intended to take a cruise on the Chasing Summer adventure, but it turned out to be a pleasant and surprisingly affordable way to move from Europe back to the Americas. From Greece we wanted to cross the Atlantic westward for South America, so started researching plane fares on www.kayak.com. On a whim we also visited www.LastMinuteCruises.com to see whether travel by ship might be an alternative possibility. On the latter website we found an amazing last minute deal on a Holland America “repositioning” cruise that would get us as far as Ft. Lauderdale, and on the former website found some equally amazing plane fares from Ft. Lauderdale to Lima, Peru, and Rio de Janeiro, Brazil. The all-inclusive cruise was about $60 per person-day, and the flights from Ft. Lauderdale to South America less than $400 each. Not bad! Luckily for us, there is not a lot of demand for repositioning cruises since not many folks can spend 16 days on a vacation, half of which just to cross the ocean! Literally about 95% of the passengers were elder retirees. The nightlife wasn’t much to speak of. Though we did miss social interaction with people born after the 1930’s, the service and luxury aboard more than compensated. For two weary travelers accustomed to living out of a backpack, it was nice to settle into a private stateroom with twice daily cleaning service and free 24-hour room service. We won’t write a full glowing review of our ship, the ms Noordam, even though it deserves one. You can easily find that with a Google search. We will say that the food and service were impeccable and the ship was comfortable and well-appointed. We ate more king crab legs, filet mignon, lobster tail and foie gras in those 16 days than the previous 16 years, and it was all of exceptional quality. Going back to the “real world” where we’re not fed like royalty and waited upon hand and foot was a shocking readjustment. The Ease – Those 16 days were the lowest-stress of our travels because there were no decisions to make. The itinerary was already planned, the transportation already arranged, and the meal plan already made. We didn’t have to decide where to eat each night or which hotel to book at the next destination. In fact, if felt more like the destinations were coming to us. The Value – I don’t know the full economics of the cruise ship business, but somehow they manage to provide a luxurious guest experience for much less than a similar experience would cost on land. Had we arranged a similar itinerary with similar food and drink traveling by land, I’m sure it would have cost at least 3x as much. The Comfort – It’s nice waking up each day to find a 5 star breakfast waiting for you in restaurant, returning to your room to find it already cleaned by the room steward, then lounging by the pool all morning as the French Riviera floats past. On a cruise ship your every need is catered to and you needn’t even break out your credit card until the end. The Efficiency – If you want to see a lot of cities in a short amount of time, a cruise is for you. In the first week aboard we saw 2 cities in Italy, 4 in Spain, and Monte Carlo. There was no wasted time on buses, planes, or trains – while we were eating dinner or sleeping, the ship was making headway to the next port. Despite its many advantages, there was one major disadvantage of traveling by cruise vs. by land… we never got to really know any place, just see them. At most ports the ship was only docked from around 8AM to 4PM. Several hours in a city is enough to see the major tourist attractions, but isn’t nearly enough to get the true flavor a place. Of course there’s nothing wrong with ordering a sample platter as long as you know what you’re getting. In the end it was a great experience and a pleasant, if temporary, upgrade from backpacker-style travel (well, backpacker “plus” style.) Check out the video below to get a flavor of life aboard the ship and see some of our ports-of-call.